3D printer introductions, shenanigans, and actual useful things! Offloading at 3 AM, thanks Erik and Arclight! Well, if you haven't been formally introduced to our newest addition to the 23b family, take a good look at Mr. Printer, a close relative of our Mr. Coffee and Mr. Radar! Not to be easily confused with a RepRap or a Makerbot, This is a Stratasys Dimension 768 SST, which stands for "Soluble Support Technology". This printer is special for the dual extruder heads, one of which lays "soluble support" alongside the ABS model itself as it's being built, to provide an extra structural bracing, allowing us to print unusual contours that lesser printers only dream of. Here's what I mean. Notice the darker layer of material that is around the base and certain structures of this print. 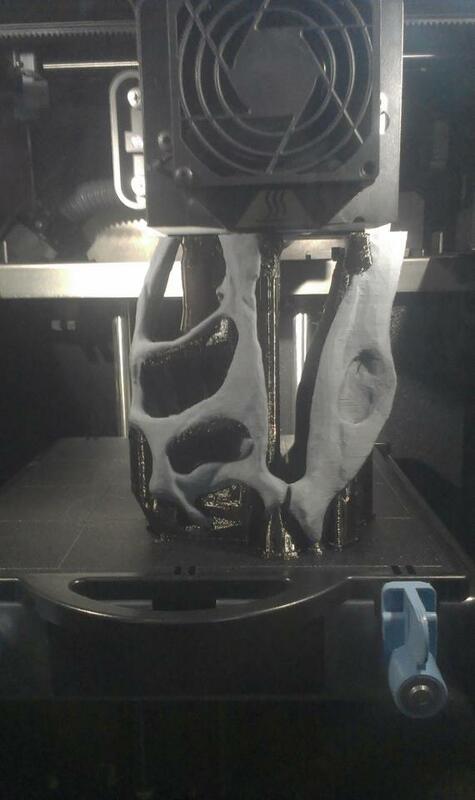 That is the support layer, meant to be dissolved away once the print is done. It appears black in this picture, but it's actually dark brown, slightly translucent, and remarkably brittle (warning! removing by hand will cause slight amounts of bleeding, it forms shards!). It's unclear what the proprietary material truly is, but I was warned by a trusted source to keep the support material dry, as it will absorb moisture from the atmosphere and clog up the extruder head. Another unusual characteristic of this material is that it goes into the machine as a white filament, and comes out a totally different color. I'd suspect a sugar addition to the plastic, as it has a burn caramel color (but no odor). This is also the older style support, the newer machines seem to have a material that does not change color as it is extruded. It's hard to speculate further on what the material is without a chemical analysis. Strangely enough, at a recent trade show, I met with a local company who compounds polymers, and also does reverse engineering, should the need ever arise. Heh heh. The support is most certainly not PLA, the water-soluble print material that bukobots and certain other printers use, as the extrusion temperature for our material is approximately 240 C.
Without a spare $1000 to spend for the special cleaning device, we quickly hacked a solution to dissolve the material away. 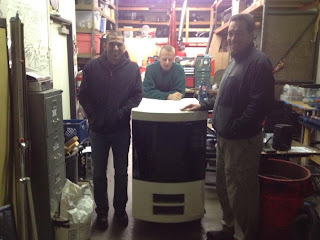 This past summer, we scored a small, heated ultrasonic cleaning tank from Ford Electronics. Dusting it off and quickly filling the stainless tank with sink water and Boraxo soap, (hey, it was plentiful and nearby) the dino head was left overnight to cook and buzz away. Once morning came, and I returned to check it out, nothing happened; all the support was still attached. As I suspected, this witch's brew needed some more "pep". We found an old bottle of Red Devil Lye to raise the pH. With a small sprinkle into the tank, the head was left for another night. Voila!, that was the trick! Out came the model from the hot, steamy, familiar smelling tank looking pristine and finished. So what do we do now with this printer? Well, for the moment, we're working on getting the cost down. It's neat to have around for making models and Gyro-cubes, fully-articulated chains printed in place as an entire assembly, as well as other neat examples. Currently we're stuck to using the $250 material cartridges from Stratasys, so that seriously hinders our Yoda and dong-making abilities. Don't forget, this machine has a HEATED work envelope of 8x8x12, but the special Dan-O-Matic model that large would be a tad expensive. This all works out to be about $5.00 a cubic inch. For reference, the model above was nearly 10 cubic inches of model (and 3 of support), so this dino model cashes in at a cool $65. $65 for a tiny bit of plastic? You've got to be kidding me. This should be at most a tenth that price. Don't get me wrong, I do not underestimate the value of having a 3d model that was downloaded off the internet, created with virtually no effort or skill. Yet here I am complaining about the small price of cutting edge technology. First world problems, right? Wrong. This technology is DISTRUPTIVE. What I mean by that, is there are incredible changes approaching in our manufacturing paradigms, the old way we do things. By implementing this technology in creative, novel ways, we can now design parts that were impossible, unthinkable to manufacture only a generation ago, then share our designs instantaneously across the globe, FOR FREE. 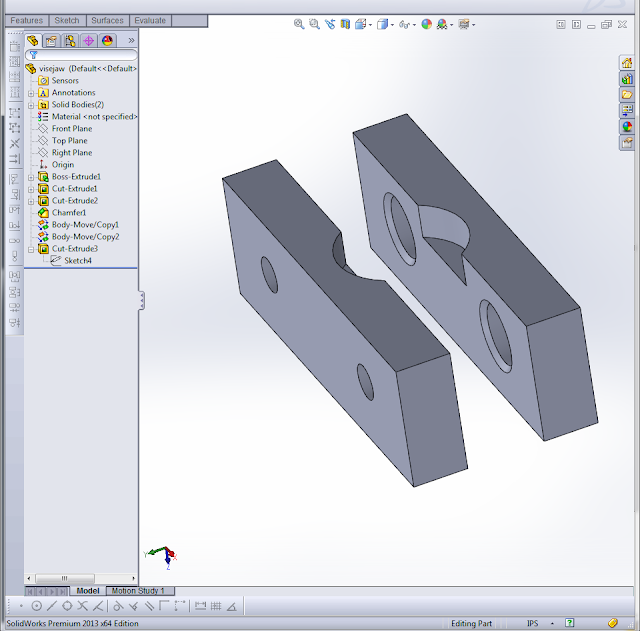 In my own short lifetime, I've seen CAD change dramatically (I started with CAD on Brøderbund Print Shop several decades ago), and only in the last few years have the tools and software advanced to the point of being cheap enough for the general public to afford, and powerful enough for them to fit on our laptops. Sure, the Stratasys printer is a bit pricey, and a RepRap is hokey and hard to setup, but consider this: remember computers in the 70's? Either you had these homebuilt, hobby units built by geeks with their friends, operated by switches and lights, or you have these large, prohibitively expensive industrial units that not every homeowner can deal with. Surely nobody in the 70s could forsee the proliferation of computers, or how dramatically they would change our lives. The price gap between the professional models and the industrial ones is quickly closing in, tracking along with Moore's law, albeit not directly. Soon the line will be blurred altogether, and then these things will be in the hands of the masses. "A once-shuttered warehouse is now a state-of-the art lab where new workers are mastering the 3D printing that has the potential to revolutionize the way we make almost everything"
Sound like anywhere you know? It's hard to say exactly where this technology is going to head into the near future. It's impossible to tell unless you're at the front of the wave, and even then, it's always churning and tumbling over itself, exposing a new leading edge. I can assure you one thing, we'll never have a big problem with 3d printed guns. If you haven't heard of DEFCAD, and the related Defense Distributed, now you have. Their project was started as an extension of some "misfit" files that were taken down from Thingiverse. Someone was apparently unnerved and uncomfortable with the thought of 3d printed AR 15 lowers receivers (the part designated by the ATF as the firearm), so Bre Pettis played it safe by removing the misfit files altogether from the website. Understandably, this new technology is scary if we can suddenly start printing unregistered weapon parts, but not every makerbot can do this (yet). Not to be deterred, DEFCAD carried on. 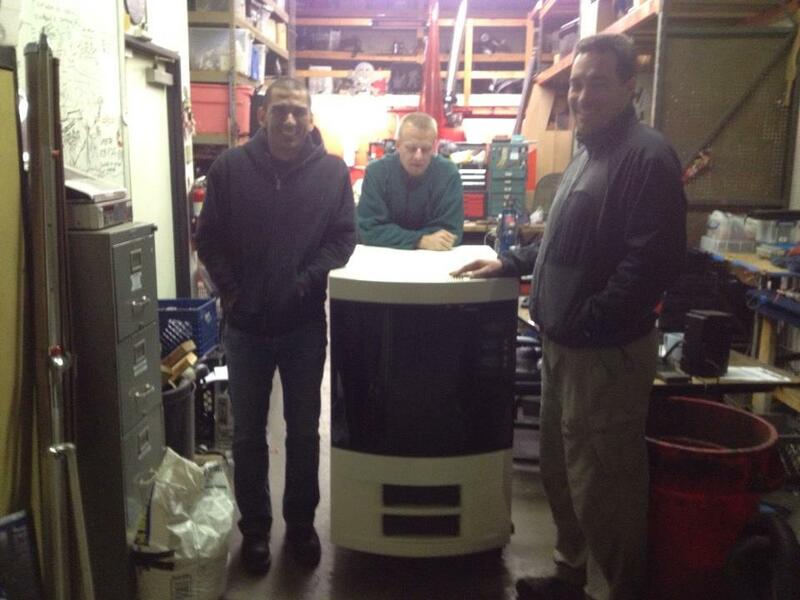 With some more wind in their sails, they collected some money to get a 3d printer of their own, Stratasys uPrint. 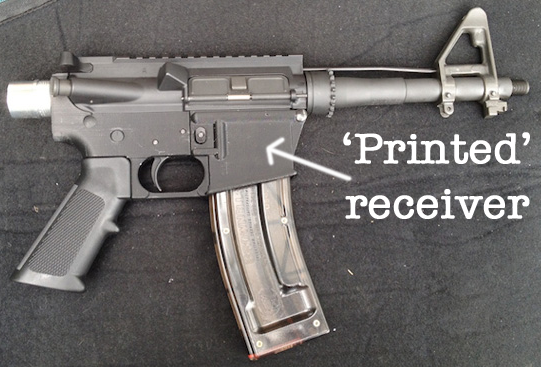 A fine printer in itself, also using the same soluble support technology (which is ESSENTIAL to producing the AR15 model so accurately) they could now make their own parts for experimentation, as well as develop their strategy, which seems to be some libertarian, texas-gun-slinger 2nd amendment fapping. Which is totally fine, especially now that they have their ATF license. However, Stratasys was slightly uncomfortable with Defense Distributed's approach, and quickly revoked their lease this past September, due to the questionable legal status of DD's operations. Keep in mind, this was all before DD got their ATF license, which happened only in the last few weeks. In retrospect, it was probably good business practice to keep the Defense Distributed project stalled for a few months, as there was enough commotion of unfortunate gun incidents in recent news. Honestly, those happen all the time, as pointed out on the DEFCAD FAQ. I suppose until there is an incident involving a 3d printed gun, they now have a taste of legitimacy since the recent ATF ruling. Determined, Defense Distributed was steadfast in obtaining a high-quality 3d printer for their own use, and this time looked to Objet for one of their $40,000 UV-cured resin printers (3X the price of a uPrint, the original machine). These printers have a much higher resolution than the Stratasys machines, due to the technology being dramatically different. One ironic point of note, Stratasys and Objet merged a few months ago, and now command about 60% of the rapid prototyping market. Whoops! Another point to remember is that some of Stratasys' biggest customers are arms manufacturers and defense. They're putting a huge 3d printer on every aircraft carrier in the US Naval fleet! There's even an entire 3d printed M4 rifle at the Stratasys office in Rancho Cucamonga. Not just the lower, the entire assembly as well as the case are all 3d printed. Obviously, Stratasys is pro-gun, they're just in a different line of business. 3D printing is making it's debut in the public eye as we speak. The last PR this technology needs is a Yosemite Sam to introduce something new and unusual, with bullets flying out of it, to the general public. Surely the Bald Eagle story is a better place to start winning the hearts and minds of the masses. (ironically, the eagle is in need of a beak after a poaching accident).Yin and Yang. Remind me again why this won't be a problem? 3d printed objects don't scale economically. If the first print costs $120, the 1000th one will also cost $120. Compare this with injection molding. There's a prohibitive upfront cost for moldmaking that requires special equipment and highly trained operators. Well, once it's up and running, one injection molded part can be produced with 15c of plastic every 30 seconds. With 3d printing, each receiver takes about 15 hours to print, and another 8 to dissolve the material away, and will always cost $120. Compare this further with CNC machining. I was at a shop last week that produces AR15 lowers on their 5 axis CNC mill. $15 of aluminum and 1.5 hours of machining time (nevermind the lengthy programming time and experience required to do so) produces a REAL AR15 lower, made the way it was intended. Again, this is a completely different discipline, but if looked at against this light, if real, mass-produced, ALUMINUM weapons aren't a problem in today's world, we're certainly not going to see a problem with inferior, lower strength PLASTIC ones. 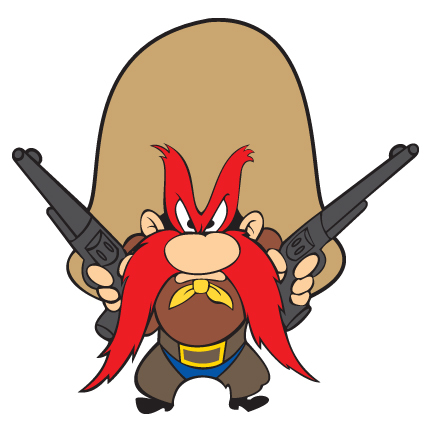 We've all seen enough Elmer Fudd cartoons to know what happens when a gun malfunctions, right? I don't think I need to experiment for myself, thank you. I'll leave that experimentation to you guys. SO WHAT KIND OF COOL STUFF ARE YOU DOING INSTEAD, MACHINIST? I see the start of 3d printing taking baby steps toward the unknown. The printer by itself is a neat toy, a novelty without a whole lot of direct use, but when integrated with other tools, the resulting combination creates a holistic environment of problem solving. I used the 3d printer to make unique, one-off fixturing for the Bridgeport mill. Flea came in this weekend with a challenge for the machine shop. He needed to modify a huge ball joint, there wasn't much to grab on to with the vise. In this case, a set of custom soft-jaws with a 1" diameter shoulder on the inside to grab the only exposed area of the ball joint. They worked together swimmingly! $12 of material, 2 hours of print time, and any Reprap can print this design. 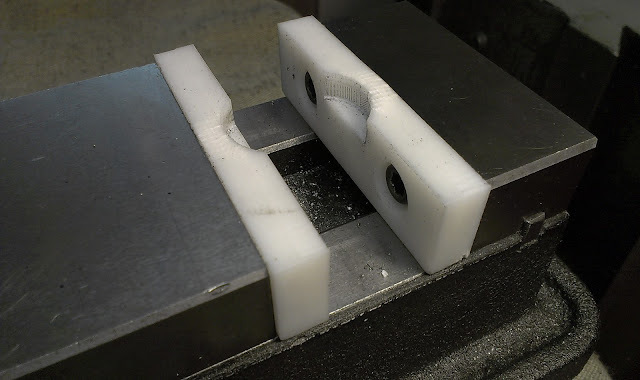 I could have made some higher quality soft jaws using more solid delrin or nylon, but consider the time to find the stock, cut it to size, drill and counterbore the holes in the right location, set up the boring head, only to use the fixture ONCE. I avoided all of that with about 10 minutes of using calipers on the old jaws, made a quick Solidworks model, and let the printer do its work. 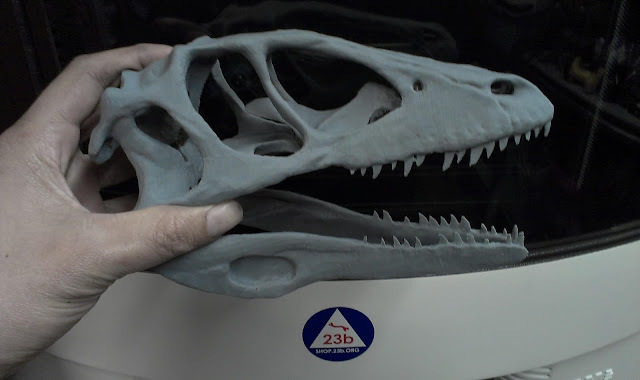 While it was busy printing away, I was free to continue doing other work, instead of screwing around making jaws from scratch, THAT is the most striking, tangible benefit of this technology. Next time I need some soft jaws, I won't even need to spend the time making the original model, it's ready to go and proven! We even know that they're perfectly flat and square, dimensionally perfect! Wow! They weren't the most solid feeling jaws in the world, and upon further inspection you can see the stress in the material at the thin point of the radius on the jaws. But for only needing to work once, I imagine that these have far exceeded their original design intent. Plus, if I flip them, they're still fresh and machinable for another project. The moral of the story? Find a 3d printer to play with, go learn a little Solidworks (or your preferred flavor of CAD), and use it to solve problems, because that makes your brain grow. Or use it to cause mischief, because I'm cool with that too. I read There Are No Electrons: Electronics for Earthlings by Kenn Amdahl recently, and believe it would be a very useful book for anyone who wants to learn about basic electronics. This funny and readable book shows you the basics of AC and DC electronics in a very easy manner, using fantastic illustrative stories about dancing chickens, green buffaloes, a naked Norwegian girl in a boat, and everything else except electronics. It's much easier to absorb silliness than a dry textbook of formulas and numbers, and it all comes together. The book covers the fundamentals of electricity, AC and DC current, resistors, capacitors, inductors, transistors, diodes, and how they work on their own and in circuit. It explains electrons and the different ways their flow is described by conventional and electron flow notation. It gives you good explanations for why everything behaves as it does. I'll put my copy in the shop library. It's only about $10, so you should give it a look here, and then maybe go buy a copy.